News that the Boy Scouts of America will drop “boy” from the name as it formally accepts girls into the program has resurfaced an old argument: the number of spaces where “boys can be boys” is under siege and slowly going the way of the dodo. What’s more, teaching boys and girls the same skill sets for real-world preparedness and community mindedness doesn’t actually prevent boys from being boys. It only forces us to recognize that what we once thought of as innately male skills are actually just good human skills. Starting a fire in the woods is not innately masculine. Identifying poison oak isn’t a boy skill. First aid isn’t a boy thing. Most of us want to know how to find our way back home if we’re lost, which berries to pick, and how not to get eaten by bears. While some argue that girls shouldn’t join the Boy Scouts because we shouldn’t want girls to be a part of a group that reinforces “traditionally masculine activities,” I would argue that survival has no gender. Boys being boys is also not, in spite of its fetishization, always a positive thing. The phrase, even at its most innocuous, gives boys a pass on behavior that they only have the monopoly on in the first place because no one else is allowed to act that way and get away with it. 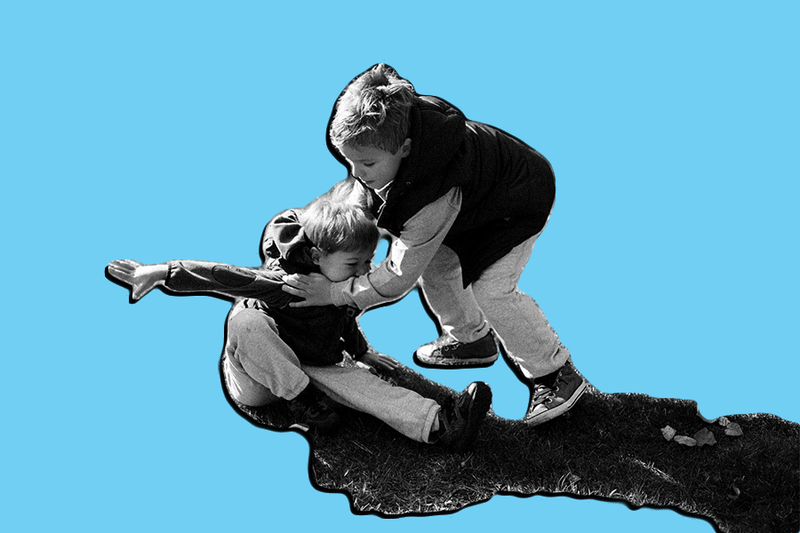 It promotes this noxious idea that boys are more aggressive, loud, rambunctious, and less refined because it’s innate to their core immutable identity, which is dictated by testosterone. It tells us to simply shake our heads at certain behavior without intervention. Because after all, it can’t be helped. It doesn’t take a gender studies degree to see where this leads for the grown up boys. Cut to male adults, where aggressive behavior is considered natural to the male species, and you see how it endorses a host of toxic behaviors. To say nothing of the way it limits our perceptions of what a boy can be. “Boys will be boys” is the first step toward a culture of no accountability for their worst behaviors. Forgotten in all this is that children are keen observers of gender conditioning and know exactly how to perform it publicly (and are far less likely to at home, when alone) when society — parents, peers — reward them for it. Equally forgotten is that before they are taught not to, girls are biters, girls punch other girls in the stomach, say terrible things, fart, pick their noses, and traipse through the house in muddy shoes no matter how many times you tell them not to. They form cliques, they bully each other, put underwear on their head, play with themselves, and they are every bit the little gargoyles that boys are. When they don’t get space and time to run around and climb and jump and explore, they have restless energy and have trouble falling asleep. We just drill it out of them as early as possible, and then we forget, and chalk it up to nature, merely because it perpetuates exactly the stereotypes about gender we are most comfortable with. Then, in hindsight, we pretend they were just born like that. So what people really mean when they say “boys can’t be boys if girls are in the Girl Scouts” is that boys are losing boys-only spaces. Aw geez, mom, do we have to include the girls in EVERYTHING? The trouble with this argument is that boys have always had most of the spaces. Most spaces for most of history outside the raising of children in the home have been not just racially segregated but also gender segregated, and that hasn’t worked well. Politics, sports, media, the military, higher education, and even ships were long vaunted male spaces women were banned from. In other words, men got to be everywhere, and women got to be in some places, if men said it was okay. They mostly said it wasn’t. Women and other minorities have slowly gained entry into some of those spaces on the shocking premise of equality, and yet, there’s nothing like equal sharing of those spaces today, outside of the number of women obtaining college degrees. Today, men dominate nearly every industry, and have a stranglehold on every institution. Men in media and are overrepresented in both covering hard news reporting and on-air time, making journalism largely a male space. Women hold only 23 percent of government offices, making politics largely a male space. Coverage of male sports far outranks that of women’s sports, with only 2 percent of ESPN’s airtime devoted to covering women, making sports largely a male space. The Augusta National Golf Club admitted two women for the first time in 2012, making even golf clubs largely a male space. In films, women only represent 29 percent of protagonists and just 4 percent of directors, making movies — and movie-making — largely a male space. Women hold just 11 percent of the top positions at Silicon Valley companies and own just 5 percent of startups, making tech still largely a male space. Women are only 15 percent of the active duty in the military, and that has been fought, disputed, and raged against by every single percentage point. We still live in a male-dominated society where men hold most of the power and most of the resources, and they’ve long given themselves permission to construct velvet ropes around any gathering they like. When women create all-female spaces, they usually do so, as the Girls Scouts themselves have maintained, to actually create a safe space away from men so women can learn and build skills and get any piece of the action men have long dominated. In other words, and this is pretty crucial: Men keep women out to maintain power. Women keep men out to try to grab onto some. (To say nothing of private, exclusive clubs and organizations that men and women form on their own, legally, all the time.) In other words, men have never wanted to take down the NO GIRLS ALLOWED sign off the treehouse. The Girl Scouts aren’t too jazzed about the competition the Boy Scouts decision has created, but that’s also because they too want to protect their membership, and they’ve long questioned whether a gender-neutral program can “create uniquely effective programming for girls,” and provide the kind of STEM initiatives they’ve launched that women are sorely lacking. The reverse — boys wanting to join Girl Scouts — doesn’t seem to be the case (I’m not saying no boy has ever wanted to join; I’m saying it took girls asking to join the Boy Scouts for thirty years for this to reach enough groundswell to move the needle). If boys want to sell Girl Scout cookies and join the Girl Scouts, they should organize en masse and start pressuring them to include boys, or alternately, make that popcorn they’re selling a helluva lot better. Alternately, the two organizations could join together and create gender neutral programming that’s win-win, just as programs in Canada, South Africa, and Australia have. It’s not because what Girl Scouts teaches is bad, per se. We could have valued the differences all along, and not be having this conversation. But we didn’t. We’ve consistently argued that whatever women are good at — while always limiting what they can even try (see science, art, medicine) — will be underpaid, undervalued, and largely sneered at by men. So in order to compete, women must, by men’s own design, master the skills they praise. And again, we’re only talking about whittling some sticks in the woods here. So if we don’t like that girls have internalized the message that Boy Scouts is a better place to be, because “boy things” are the things strong, resourceful, good leaders can do, that’s on us. Girls wanting to get those skills — in an inclusive setting with other boys, no less — is nothing worth being outraged about. By valuing them far and above “girl skills,” we continue to define true equality for women by access to and mastery of “boy” things, and those spaces. Then we balk when they want in on it? That is the only hypocrisy in this debate.